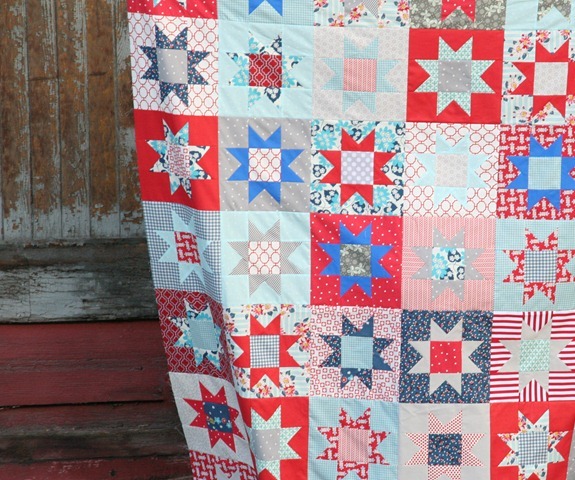 Nothing rings in July like a (really bright) red, white and blue quilt. This quilt is a twin size, 60″ x 80″ with 48 star blocks. I think this might even be the 1st star quilt I’ve posted on this blog…or 2nd…beats me. Either way I love it and all its blindingly bright goodness. It’s chocked full of different fabrics so I’m not going to attempt naming them all…not that I know all of them (I do). Now to finish this in time for the 4th of July! Gorgeous! I love a good star quilt. i love it!!! it's really beautiful. I love this one! The star pattern is perfectly patriotic! Great job!! Very lovely. It does say 4th of July! Oh, how I love the addition of the grey with the red and blue (aqua). Wonderful! Fun! And just in time for the 4th! Beautiful! What size are the blocks? I'mmaking a lap blanket right now with those stars and my block size is 9 1/2 ". I'd sure like a pattern for a 12" block. I love your Americanna colors. Love the red, White and blue done in so many different shades and fabrics. You have done very fast, the other day we were taught fabrics. You have been wonderful. Beautiful! Makes me want to eat a hot dog! it really is a happy quilt! seriously??? how do you find the time!! Love this! I really don't like patriotic things but I have to admit this is beautiful :) I really like the grey mixed in. I love Star quits..and this one is PERFECT!! Love it! 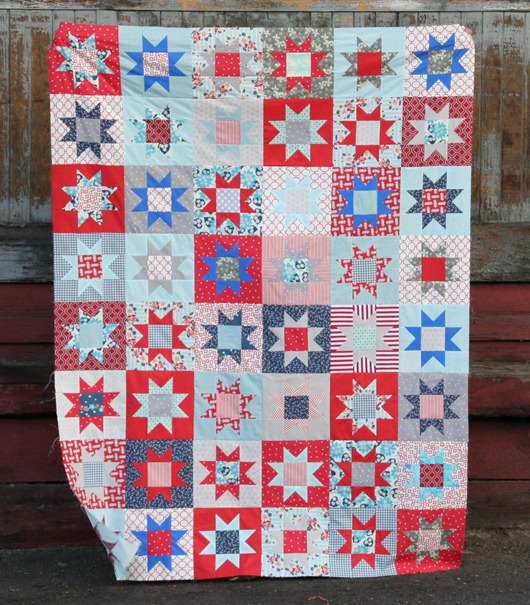 I'm usually not a big red, white and blue fan but this quilt is beautiful! You've picked out some fabulous hues and it looks very fresh and fun. Love it!! Very pretty!! I love a star quilt too!! Love, love all those reds, whites, and blues! Great quilt. Again, I love the navy and bright blue! How very festive! You mixed them up perfectly! I love that SO much!!! I would love to see how to make a star square (hint, hint). You make such beautiful quilts. I am working on a Chain Reaction quilt for my little boy. Love it! that is the happiest 4th of July quilt i have ever seen! That is an absolutely perfect Fourth of July quilt!!! This is the most beautiful quilt! I wish I had your knack for color! I like that you used a traditional sawtooth star and gave it a modern look! Yes, I agree, a happy, freedom loving quilt! I love it!!!!! did you use a tutorial for the blocks? I REALLY want to make a quilt like this. I have a lot of those DS fabrics from joanns. oh this is gorgeous! I am totally going to have to borrow this idea. I love the traditional blocks, as most of the quilting that I have done has been more modern. My mother in law loves anything red,white,and blue. Is there a particular tutorial for the block or a standard name of the star block you used? Love the quilt. Great job! Love it! You've inspired me to actually finish my 4th quilt that I started last year. On July 3rd. I love july its the best month and craziest! Where is this pattern from i want it! I love to decorate for the 4th and need a quilt! This is a great July quilt! You can never go wrong with stars, that's for sure! I imagine it was fun picking out each color combination for each block!! The quilt came out fun and festive! Bravo!! So gorgeous!! Absolutely love it! !